Early in his career, the playwright and director Christopher Hampton asked his esteemed elder, John Osborne, if there was any advice he might impart on pursuing a life in the theatre. ‘Never marry an actress’ was Osborne’s response. In a slightly extended riff on the subject, Osborne held that actresses made ‘impossible mistresses and even worse wives.’ Not that it prevented him from marrying three of them — Pamela Lane, Mary Ure and Jill Bennett; nor indeed, in taking on numerous mistresses engaged in the profession. One of the very few breeds Osborne held in greater contempt than actresses were critics, and Osborne married two of those (Penelope Gilliatt and Helen Dawson). Clearly, this was a man who failed to live as he preached. 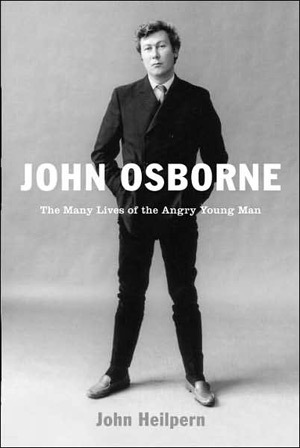 Such failure, as revealed in John Heilpern’s new biography, John Osborne: The Many Lives of the Angry Young Man, was the least of Osborne’s sins. Osborne held loyalty as the paramount human virtue, yet he practiced precious little of it in relations with friends, and certainly with his many wives. He was a man who never shook free of the ‘Angry Young Man’ moniker (unlike similarly branded contemporaries as Kingsley Amis and Alan Stilltoe, for example), yet it turns out that other sobriquets would have served him equally well: ‘cruel,’ ‘bitter,’ ‘vindictive’ and ‘self-loathing,’ offering a start. In Osborne, we find a man who wrote, in a volume of autobiography, ‘Any year in which my mother died can’t have been all bad.’ Later, in the immediate aftermath of his ex-wife’s suicide, he rushed into print to heap scorn on her memory, and, most unforgivably, he evicted his sixteen year old daughter from the house they shared, leaving her without any means of supporting herself or her continuing education. He did so with little more reason than the fact that she didn’t conform to his idea of what an interesting, vibrant child should be. A letter he wrote to terminate their relationship (the two never spoke again) is mostly re-produced in Heilpern’s account — ‘A life of banality, safety, mediocrity and meanness of spirit is what you are set on…’ — and it is a model of derangement, a playwright’s high-flown, self-serving monologue thrust upon his child. Heilpern, currently the drama critic for the New York Observer, took on the task of ‘authorized biographer’ at the invitation of Osborne’s widow, Helen Dawson, formerly a colleague at the London Observer. If he may be said to have an agenda, it would be to resuscitate the reputation of the playwright’s work. It’s a noble goal, but no easy task. When we think of major British dramatists from the second half of the last century, the names Pinter, Stoppard and Hare spring more easily to mind. Pinter, for one, forged a more indelible style, and each of the three has displayed a greater consistency, a broader range and depth than Osborne proved capable of. Also, somewhat unhelpfully, Osborne’s best-known play, Look Back in Anger (1956), hasn’t aged particularly well (though in Heilpern’s view, it isn’t even among his best couple of works). Indeed, reading Look Back in Anger today (as opposed to seeing it performed — Osborne’s plays are not revived with any great regularity), one finds the work surprisingly small and immature. Most interestingly, rather than being a statement of great political intent (as many considered it at the time), Look Back in Anger turns out to have been considerably simpler in its motivation — largely, it served as a young playwright’s exorcism of a failed marriage. Those parts hewing most closely to autobiography offer its more powerful truths, while the invented parts ring utterly false. Osborne was English to the core, and he cared passionately about England as a land, as a people, and as a culture. Still, the plays he wrote were seldom overtly political. Like many of his countrymen, he felt betrayed by the false dawn of the post-war era, but the plays themselves had a tendency to ‘point to the wound, not to the cure.’ In spite of which, there were those who felt he shifted immediately from Left to Right in light of first acclaim — and how they reviled him for it. In England of course, nothing kills affection quite like a quick brush with success. Having won a screenwriting Oscar for Tom Jones, in 1961, Osborne suddenly had more money than he knew how to spend, and he spent accordingly — lavishly, and in full public view. Or, at least, he did for a while. Then one day he belatedly realized it was all gone… all of it, along with more money than he might ever hope to earn again awaiting him in debts. Osborne lived as he wrote: passionately, without apology — and in both cases, with precious little editing. Two years after Inadmissible Evidence (written at the age of thirty-four), Osborne ended his third marriage (to Penelope Gilliatt, a film critic for The New Yorker), suffered a nervous breakdown, and went into a long, inexorable decline. There followed a disastrous marriage to the fiery actress Jill Bennett, and finally, a union of relative peace with Dawson, lasting until his death in 1994, on the eve of his sixty-fifth birthday (from heart-failure, with complications from diabetes). What’s almost surprising is that Osborne had any friends left by the time of his death. His private life was unremittingly turbulent, clouded by extended periods of debilitating depression. Any man who marries five times is a man whose life comes to be dominated by women. He felt that women defeated him, and moreover, that they’d failed him. The opposite is likely true. Of his five wives, each talented yet unstable, one died of an accidental overdose (Ure, at age forty-two), another died from alcoholism (Gilliatt, at sixty-one) and a third committed suicide (Bennett, at age fifty-nine). In his own summary of things, Osborne said that he approached relations with women like ‘an improvising chimpanzee faced with the dashboard of a jumbo jet.’ Heilpern’s triumph in this account is both his clarity and a lack of condescension to his subject. He tackles the major events in Osborne’s life individually, compartmentalizing each while remaining faithful to the broader chronology. He remains dispassionate, even though, on occasion, it is jarring to be dragged out of the narrative to be reminded of the impartiality of our guide. Ultimately, however, one comes to understand this as the author’s best defense against his subject, a toxic, aggrieved creature whom he describes gracefully, showing him not as any sort of monster, but instead as the deeply flawed artist and man he was.